The bats were for a long time difficult to classify. Originally they were seen as strange birds. They had wings and they could fly, but they definitely differed from the other birds by giving birth to living suckling young. In the 17th century John Ray placed the bats among “the four-feet animals”. Linnaeus followed his example, and noted that the suckling of the young qualified the bats to belong to the group he called the mammals. The bats are the only mammals capable of flying. They mostly fly at nighttime, and they generally have bad eyesight. On the other hand their hearing is excellent. To orientate themselves they give up a cry that works as an echo sounder. The signals are reflected by objects in the bat's environment and helps it to orientate. The cries are of high frequencies and cannot be heard by a human ear, but there are detectors that can be used to listen to the bats. With a detector it is possible to distinguish what species of bats one is listening to. In Sweden 16 species have been seen, but many of them are nowadays uncommon. The Swedish bats eat insects. Recent changes in forestry have changed the insect fauna, which has resulted in a decrease in number in several bat species. One of the most common species in southern Sweden is the brown long-eared bat, which is commonly found in church towers and other buildings. 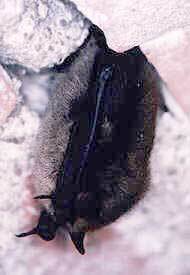 The brown long-eared bat was described by Linnaeus. In the tropics there are bats with different feed habits. A big group are fruit eaters, flying among the canopies of trees. In this way they disperse the seeds and they can also be important pollinators. Many trees have flowers or fruits adapted to the bats. The trees can for example have light coloured flowers hanging on long stalks, free from the foliage of the tree. In South America there are species of bats living partly or exclusively of blood. Those are called vampires and are named after the myths about Count Dracula from Transylvania.